Is a Longer, Interactive Pre-Roll Ad Better Than Breaking Up Video Content? For brands and video platforms struggling to get people to sit through their ads, video streaming site DramaFever and engagement advertising platform true[X] think they have a solution: Allow people to watch a longer, interactive ad in the beginning in exchange for a seamless viewing experience. 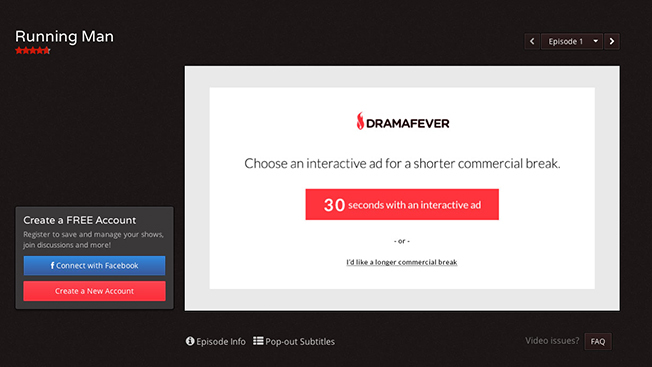 To test the theory, DramaFever gave viewers a choice. They could watch the series Running Man with short, regularly scheduled ad breaks, or they could watch a 30-second interactive ad for the 2014 Toyota Highlander created by true[X] at the beginning of the program. If they chose the latter, they were allowed to watch the show without any interruptions. A little less than 63 percent of the show's viewers chose the interactive ad or 25 percent of the site's total visitors. However, out of those who did, 86 percent watched the ad for at least 30 seconds and completed at least one interaction. "DramaFever's strong point is a user base that's very passionate about the content, which means they're more ready and willing to provide their full attention—especially when providing that level of attention allows them to spend more time with that content and less time in commercial breaks," true[X] vp of business development Matt Howe explained. David Gandler, vp of ad sales at DramaFever, pointed out that it also provided a better experience for the consumer. "The end result is less advertisements and less noise for advertisers—securing greater mindshare," he wrote in an email, "while for the viewer, [it's] decreased ad viewing time by over 40 percent (for users who engaged). Win-win."